SAN FRANCISCO (KGO) -- Remember the "Impossible Burger" we were telling you about last week? Well, it seems people can't get enough of it because it has become one of the most popular items on the menu and selling out at two San Francisco restaurants. It looks like a hamburger, sizzles like a hamburger, and even tastes like a hamburger, but this burger was actually made in a Silicon Valley lab, from plants. "It's a very hard thing to do, but it's doable," said Patrick Brown of Impossible Foods. 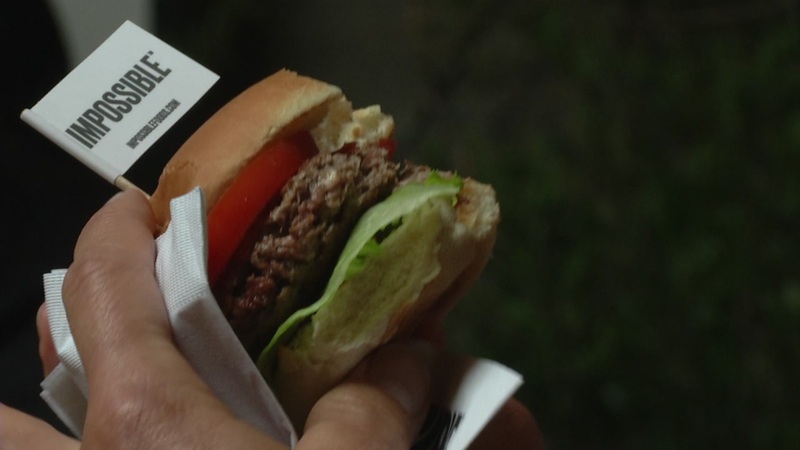 The burger is the brainchild of former Stanford professor Patrick Brown. He created Impossible Foods, which recently showed off the fruits of their labor. "We didn't just slap together a bunch of bits and pieces from plants and call it a burger, we did the deep research to understand what makes a burger so delicious," Brown said. You can't get the burger just anywhere yet. The chefs at Jardiniere and Cockscomb have been the only restaurants to have this new burger on their menu. At the Jardiniere, they issue the tickets at 7 p.m. every night to make sure they can meet all the orders.